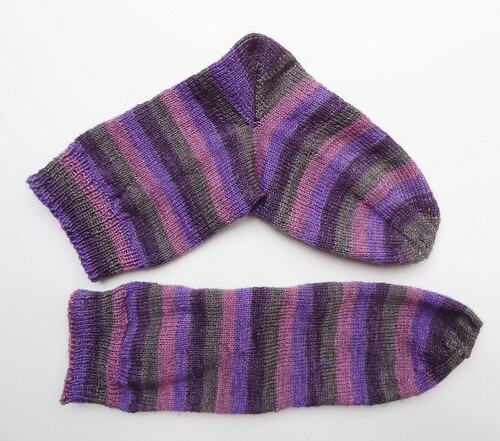 Last month I shared my latest cast on socks project, using yarn from The Wool Barn. The Superwash Blue Faced Leicester (BFL) yarn that I used is 400m long and has a nice smooth handle. This base of yarn really is lovely to knit with. Since I have now finished the socks and got them on my feet, I can confirm they feel lovely to wear too! I really love these colours together and the name makes me smile whenever I type it, Goth Girl Rehab sums up the combination nicely. As you can see from this photo, I like a nice long leg to my socks. As someone who spends a lot of time with her feet up on a sofa, my trousers quite often ride up and the longer leg on the sock means that the gap left when they ride up is covered up in knitted goodness instead of being bare. As usual I shaped the toes tailored specifically to be worn on my left and right feet. I made the right foot 1/2" longer than the left. When I did the heel turn, using the Fish Lips Kiss Heel, a version of the short row heel, I cut the working yarn after doing the heel and removed the sections that didn't follow on the stripes at the front of the foot. I think it is pretty seamless. In case you were wondering about the joined yarn being noticeable, it isn't. I weave my ends in after closing the gap left, in opposite diagonal directions. It is invisible and leaves no bumps. I did increases for the calf starting 4" from the heel turn and lasting 1" in duration, by knitting into the stitch below, set in by 6 stitches from both ends of the back needle. I then did my usual 2" cuff and used Jeny's Surprisingly Stretchy Bind Off. These were my standard socks. They were nothing different or unique, in fact the only difference from previous socks, is the yarn and I really wanted to share with you that it is lovely, I don't know if it would stand up to lots of hard wear but it makes lovely house socks at the very least, go and buy it!